A pair of supermassive black holes in orbit around one another have been discovered by an international research team including Stefanie Komossa from the Max Planck Institute for Radio Astronomy in Bonn, Germany. This is the first time such a pair could be found in an ordinary galaxy. They were discovered because they ripped apart a star when ESA’s space observatory XMM-Newton happened to be looking in their direction. 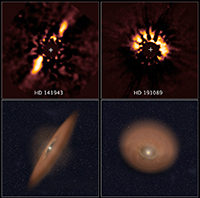 The findings are published in the May 10 issue of the “Astrophysical Journal”, and appeared online today at the astrophysics preprint server. Most massive galaxies in the Universe are thought to harbour at least one supermassive black hole at their centre. Two supermassive black holes are the smoking gun that the galaxy has merged with another. Thus, finding binary supermassive black holes can tell astronomers about how galaxies evolved into their present-day shapes and sizes. To date, only a few candidates for close binary supermassive black holes have been found. All are in active galaxies where they are constantly ripping gas clouds apart, in the prelude to crushing them out of existence. 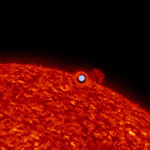 Now, astronomers at the Cerro Tololo Inter-American Observatory (CTIO) and at the US Naval Observatory (USNO) are making use of the latest technology, speckle imaging, to measure the separation of close binary stars. By observing them over a period of years, their obits have been determined with exquisite precision.